Notes: Common in coniferous woodland throughout much of the British Isles. In Hampshire and on the Isle of Wight XXXX. Wingspan 10-13 mm. 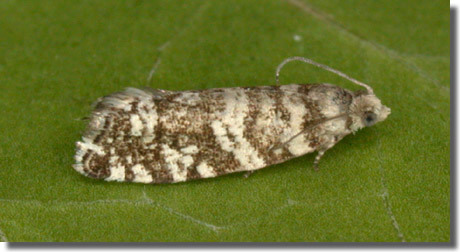 In this species the fore- and hindwing coloration is brown compared with the grey-brown appearance of E. nemorivaga; E. tedella may be further distinguished by the cream-white labial palpus and head and the distinct basal and subbasal fasciae which do not form a basal patch as in E. nemorivaga [Bradley]. Larva mines needles of Norway Spruce, subsequently living within a spinning.